Deep frozen. No artificial colours, flavours or preservatives. Vegetarian. 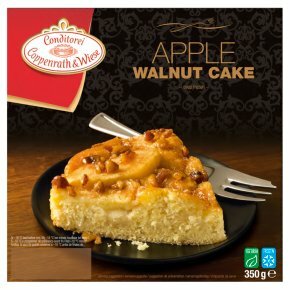 Sponge cake with juicy apples, persipan and ground almonds, delicately flavoured with cinnamon and topped with caramelised walnuts. Dear customer, despite being extra careful at production, it is possible that this product may contain nut shells. We ask for your understanding. Remove product from all packaging.Defrost at room temperature: 2 hours. Don't pre-heat.160 °C (Fan assisted oven 140 °C)20 min. 650 W(Defrosting not required):Place the cake on a suitable plate with a microwave cover.Allow cake to cool for 15 minutes.4-6 min.